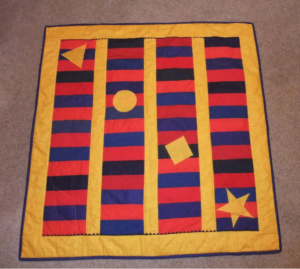 The majority of children love to have bright colours in their quilts. Our theme for 2019 is to make a quilt using ONLY red, blue and yellow. The size of the quilt should be 36″ – 42″square. The finished quilt, or top, can be given to your Area Co-ordinator or, if preferred, handed over at the Festival of Quilts 2019.